In an effort to help keep my crafty/sewing resolutions I'm joining the 2016 Finish-A-Long, so I can finally finish projects that are just hanging around. This is my main goal for this quarter. I am going to finish this queen size bed quilt for my husband and I. I've had the top pieced together for a year now (and prior to that cut out the year before!) so it is just time. I'm going to keep the quilting simple since this will be on our bed and get washed plenty. I would also like to finish 2 garments, another Everyday Skirt and shirt. These should keep me busy and help achieve the goals I set for myself! 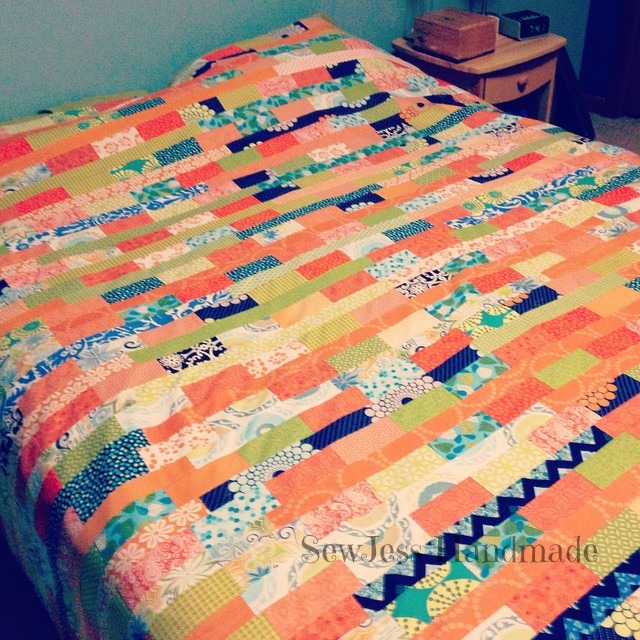 I love that quilt top, it's just the thing I needed to brighten up this dreary day! Good luck with your list and thank you for participating in the FAL, on behalf of the 2016 global FAL hosts! Thank you for visiting. I hope this will be the extra push I need to get this quilt done! Pretty bed quilt - will be great to have finished. Have you decided what design to use? I think I'm going to do some simple loops. Time to get quilting! Thank you for stopping by. Its a beauty!!! You can do it!!! I've done the same thing. Hopefully listing all of these projects help. Your fabric choices are lovely. Have you figured out how you're going to quilt it? Such a sunny quilt. It will be very cheery to wake up to.